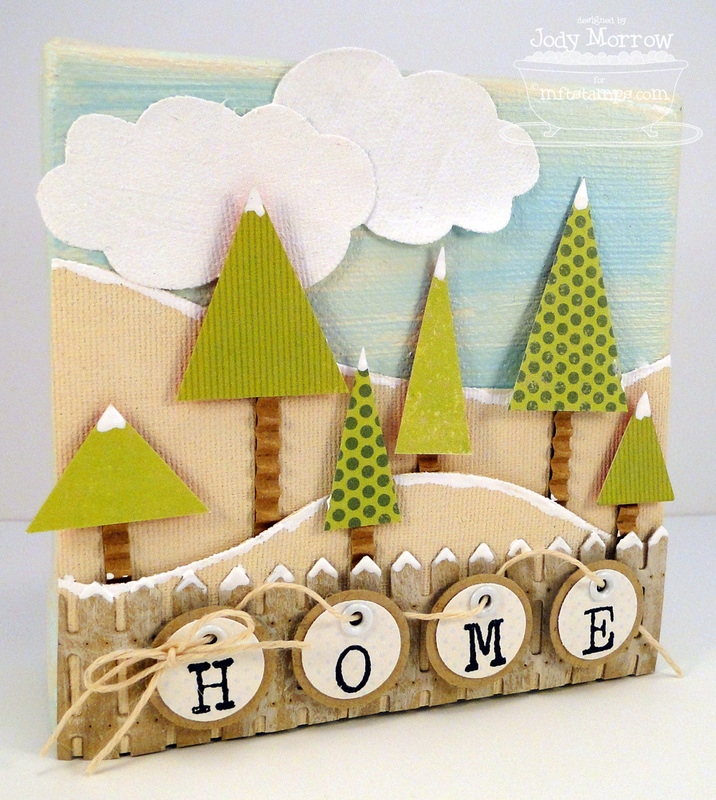 Each canvas was painted with a gesso/paint mix using Claudine Hellmuth products. I used a combination of light blue and tan paints for the base. I used white paint for the "snow" and Cloud Trio, and used the tan paint for distressing. 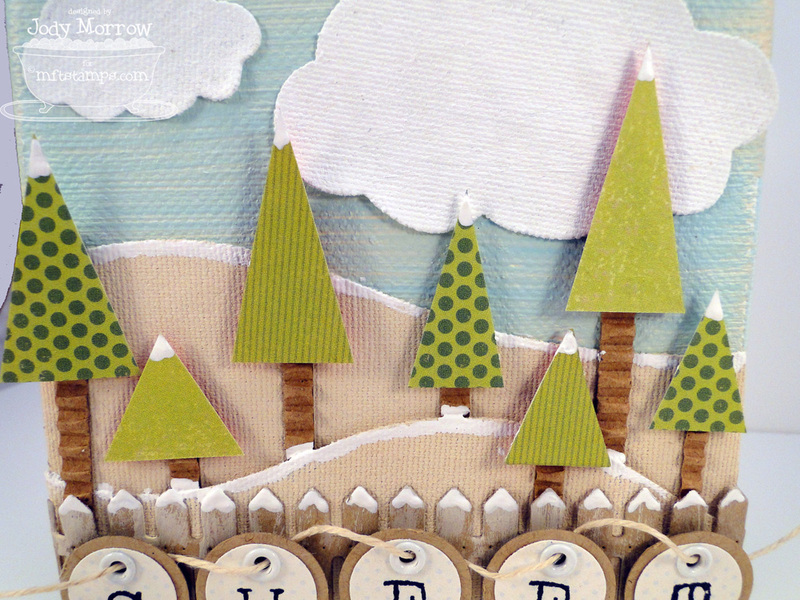 The trees were cut by hand and perched on strips of Corrugated Card Board Paper from the MFT Boutique (retail location). The Cloud Trio and Snow Drifts were cut from Sticky Back Canvas. The Picket Fence was cut from Kraft Card Stock and distressed with paint before being topped with white paint (aka snow). 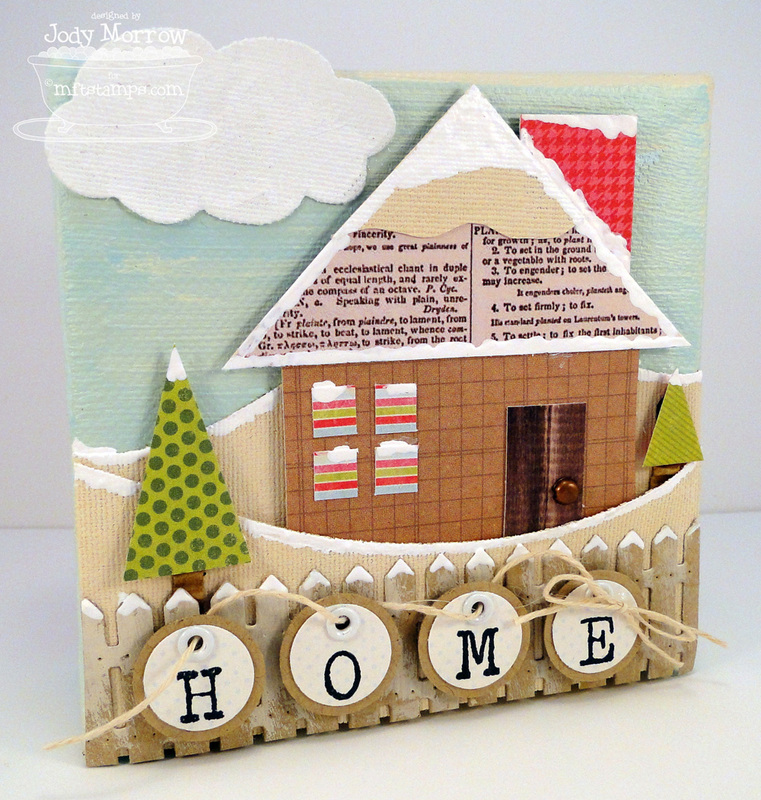 The words HOME SWEET HOME were stamped on a lightly patterned paper using Typewriter Alphabet and then cut out, creating circular tags, which were matted. I added an eyelet and added Hemp Cord through each eyelet in a "wonky" fashion. 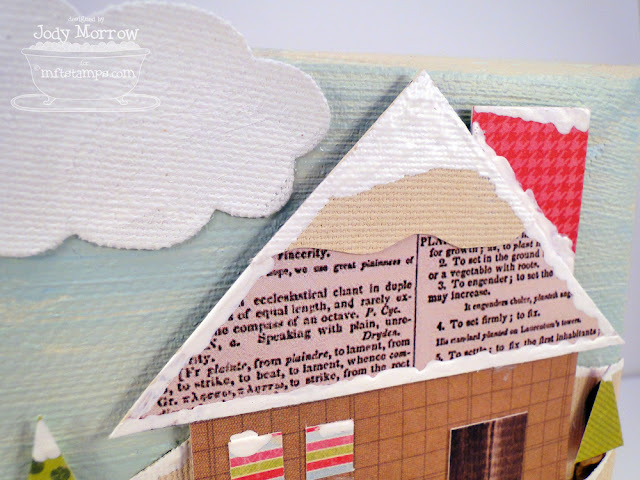 For the third panel, I created a house out of patterned paper and basic shapes. I tucked it in the Snow Drifts and added plenty of "snow". A couple trees flank either side of the house. 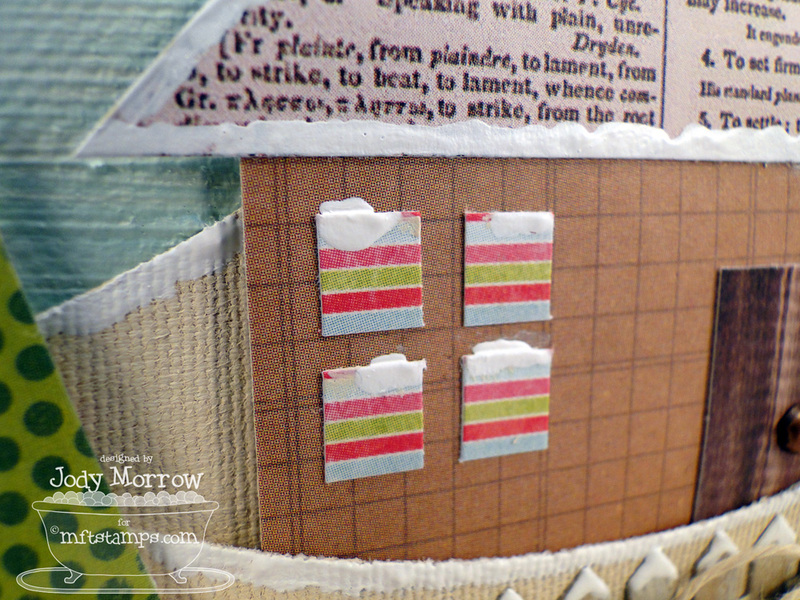 The windows are four tiny squares of patterned paper. The door knob is a tiny copper brad. Here is another look at the trio. They should be displayed side by side, but this is the only way I could get them all in my light box at once. Each canvas is 4" X 4". Want to see what the rest of the team came up with for the challenge? Click on over to the MFT Blog for the complete, linked list. 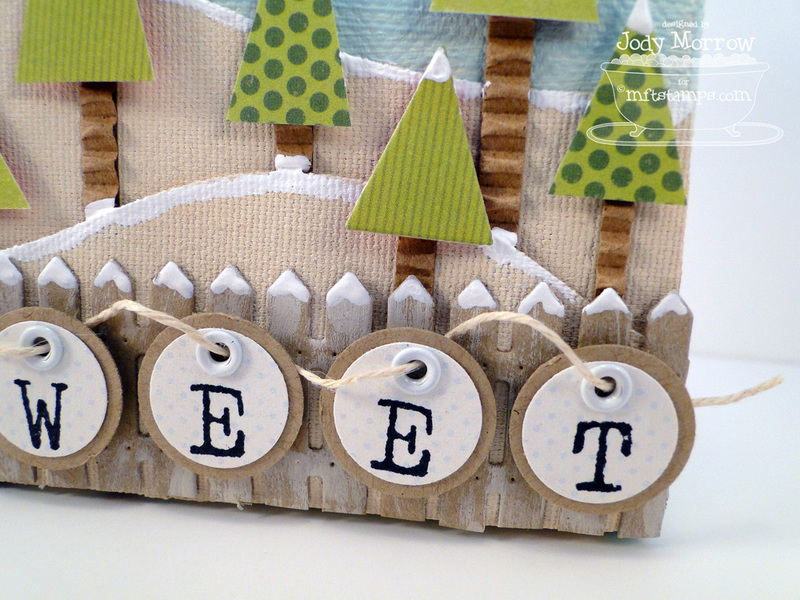 OMGosh these are so adorable, I love to be around other crafty people who inspire something totally new and exciting! These are fabulous. Oh my word!!! 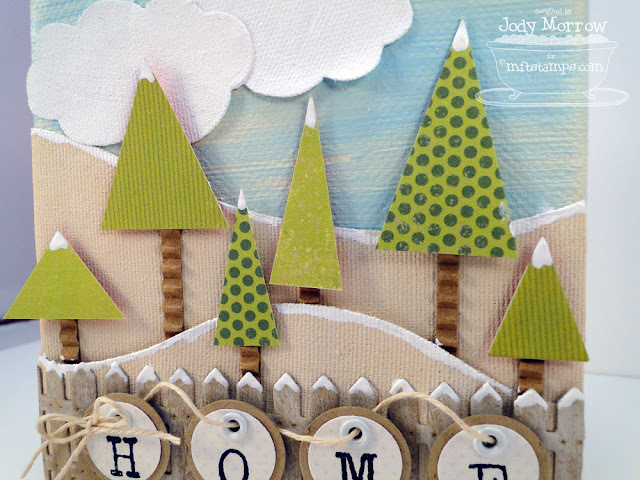 These are FANTASTIC, Jody!!! Love all the snow tipped pieces. Perfect for my house ;) What fun to be able to stamp and create with Kim!!! LOVELOVELOVE! It turned out SO cute!! Oh these are pretty Jody! I love how you snow topped everything!....so great! These are drop dead gorgeous Jody!! 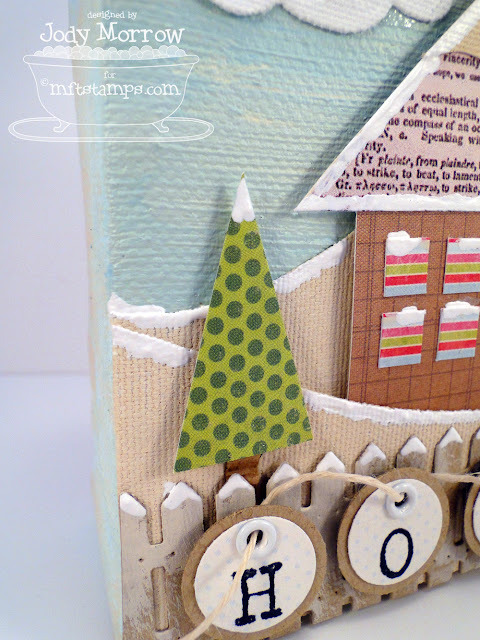 I love the whimsical feel and each of the sweet elements, like polka dot trees and striped windows. Adorable!!! 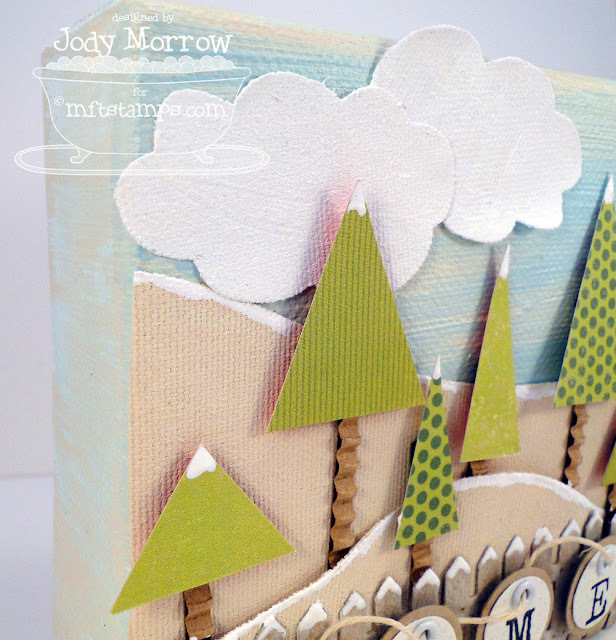 Beautiful project Jody! 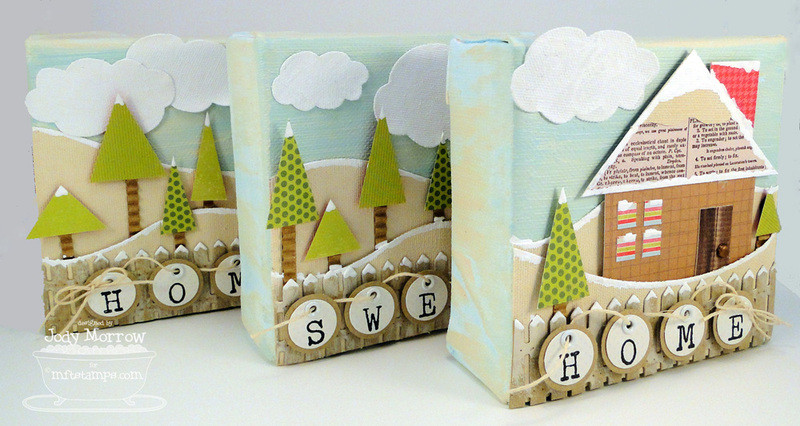 Love your trio of canvases! Great way to show case all those awesome Die-namics! Obviously made with so much love and detail! Thanks for the inspiration! Eeep, these are adorable! I so want to run to Michael's RIGHT NOW and pick up some of these mini canvases, but what about the gazillion other projects on my list?! All fun aside, this project is homespun happiness! This is sooooooo cute!! I love the little scene. 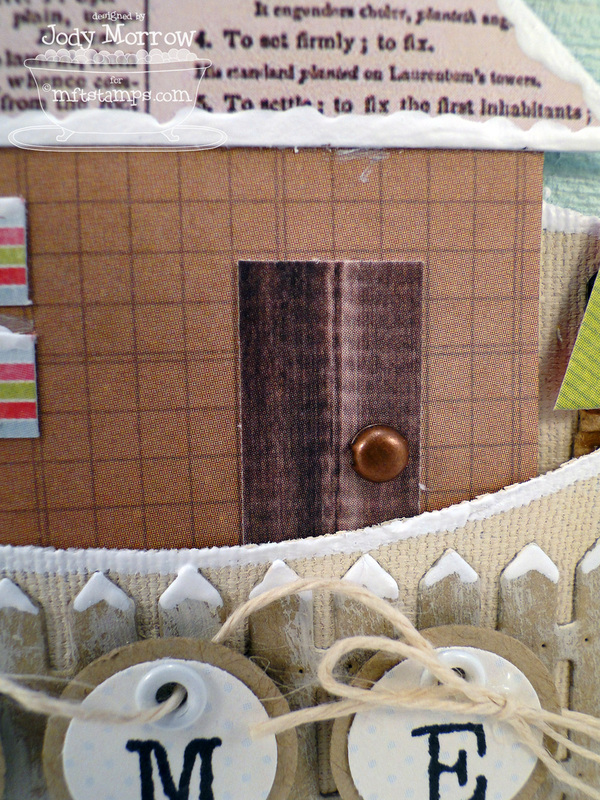 Those letters also look JUST like the old school metal scrapbooking ones! Taaaaa Daaaaaahhh!! Beautifully done. Love all the details. Wow! I keep saying "wow" to everyone's post but these projects are just stunning!!! I love all the snow tips!!!! Beautiful! 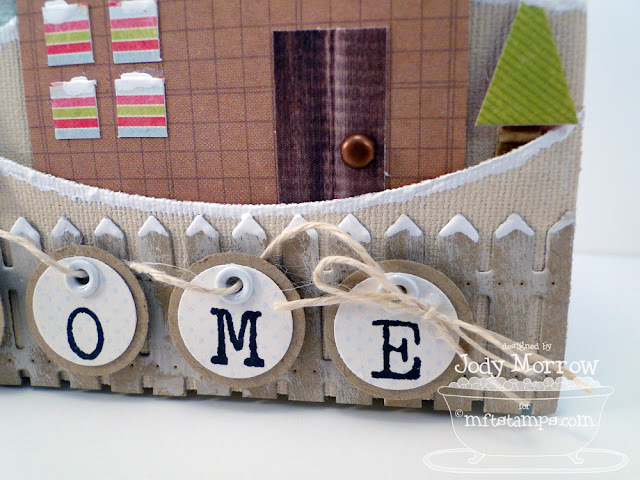 Awesome and fantastic projects Jody, I really love the colors and how you've made the words home sweet home! Holy Freakin' Cow! This is absolutely amazing. I love all your special touches.